The club was unofficially started about 4 or 5 years ago by our current chairman Rick Longhurst. 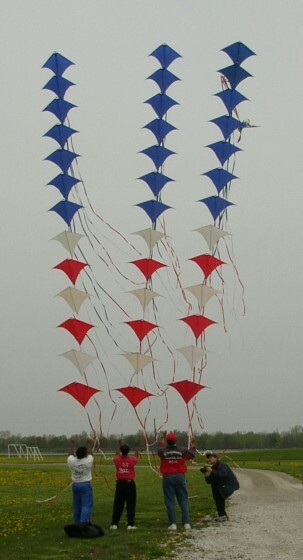 On May 10th, 2003 we held our charity fly which, despite the very bad weather conditions, was a success. 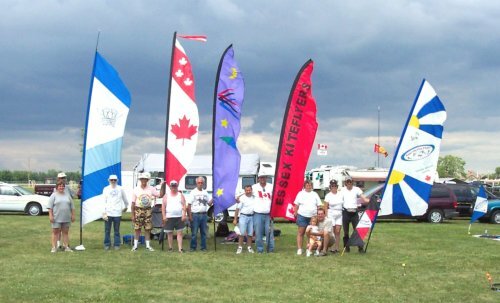 We had a total of 17 flyers register and our star performers were the Windjammers from Detroit, Michigan, who flew their 13-kite stacks to the wonderment of all present. We raised a total of $874.15 for our charity thanks to our corporate sponsors, local businesses and the registration fees. 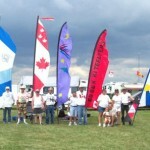 Since then we have had our “Farm Fly“, which was a 2 day event and drew a total of 29 flyers from Michigan, Ohio, and Southwestern Ontario… We have also participated in the AKA National Kite Month event and the One Sky, One World for Peace Fly. 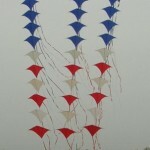 In September of this year we became an officially recognized club by the American Kitefliers Association. We were the first club to be recognized under the new rules for International Clubs. We are now in the planning stages for our 2nd Make-A-Wish fly which will be called “The Andrew Baxter Memorial Fly “ in recognition of an 18 year old who died suddenly the day before our last “ Make-A-Wish “ fly and who was a firm believer in this foundation. for more info about their charity events and tons of pictures! This entry was posted in 2003, Issue 33 (Nov/Dec), KL Archive and tagged canada, club, essex.